Celebrate with family on all the holidays - we've gathered together ideas for making your family holiday parties and celebrations fun, frugal and unforgettable. Find holiday activities, recipes, decorations and home decor ideas that won't break your budget and will give you more time to enjoy your festive classroom and family celebrations. SPECIAL DAY this month! FRIDAY the 13th! 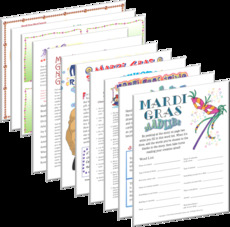 Mardi Gras masks for you to make: Print, Cut, Color, Decorate with feathers, buttons, paper - click here for printable Mardi Gras Masks. Craft a hand made card from free clip art, make St. Pat's day wedding favors, color some lovely shamrocks or leprechauns, pots of gold and rainbows for St. Patty's Day party decorations. Write a letter or Irish holiday party menu on shamrock shaped lined stationery. Brew up genuine Irish Coffee with this free recipe from a descendent of the original chef who invented it! Learn about more than just recycling - study the impact of global climate changes, find areas of contamination or pollution, take a quiz on your use of energy compared to other people on the planet. 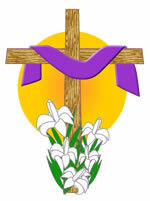 Print a free Easter greeting card or design one of your very own with our clip art. Keep the kids busy with coloring pages and printable coloring cards or print and fold Easter cards. Find activities for Easter crafts, read a story about Lent and Easter or make some delicious treats for Easter Brunch. Print some Easter Gift Coupons as an alternative to candy in the basket, or for teens and adult gifts. Print a special Mother's Day gift for your Mom or grandmother - add your own thoughtful promises to free full color love coupons. Make homemade spa goodies for Mom - Bath Salts, Effervescent Bath Powder, Herbal Soap-filled Scrubbies, and add a crafty label or gift tag to the package or jar. Craft a scented greeting card, or a lovely bookmark gift. Or, print out free Mother's day cards: some in full color, others ready to decorate with markers, glitter, ribbons, dried flowers or whatever you have on hand. Give Mom a set of personal labels for books and storage bins. Print and cut free labels and bookplates. If you feel really creative, design your own gift tags or labels or a memory book with free Mother's Day clip art. Dads deserve a special award for Father's Day. Print and customize a World's Best Father certificate to present to your dad, step dad, grandfather, uncle or partner for Father's Day. Need a unique Father's Day card? We've got print-and-fold full-color cards for Dad and for Grandpa, cards to bring out and color in, plus some great IOU gift coupons to print, cut and make a booklet of gift promises. Dad or Grandpa will appreciate a new bookmark. We have several different designs in full color - just print and cut, paste or laminate - dad will never lose his page again. Or, make a bookmark of your own design using free clip art or pictures from our coloring pages. Enjoy southwestern style and decorate with the colors of fiesta for Cinco de Mayo (May 5), Day of the Dead or a rodeo-style barbeque - celebrate with a southwest flair. We have fun fiesta clip art and coloring pages ready to help you decorate, make invites and celebrate with style. Learn how to make a pull-string pinata! Hanukkah is the Jewish Festival of Lights, a holiday that dates back to ancient times. The name Kwanzaa comes from the harvest - the Swahili phrase matunda ya kwanza - which means "first fruits." Capture the special moments of your family life in photographs and mementos to create a family Christmas scrapbook each year for a very special New Year gift. No matter how old you are, or how professional and sophisticated you may appear to others, when you go home you often regress into a petulant or oppositional child. You may never behave this way except when you are with family. This is because situation cues (i.e., the presence of the people you grew up with) evoke certain feelings and responses from you. Special times often include traditional and favorite foods, from snacks to main dishes and everything in between. United States Thanksgiving feasts generally include the traditional roast turkey, bountiful vegetables and an assortment of tempting pies for most American families. Easter is a time to break Lenten fast and feast on lamb or other roasted meats in addition to sweets and tender delicious spring vegetables. 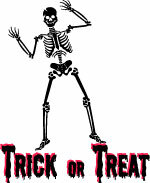 At Halloween, children's parties often center around candies, cookies and other sugary delights. Specially decorated cakes, snacks and desserts are a nice treat for those who can eat them - but don't forget about good nutrition when planning your next special holiday menu. Cinco de Mayo fiesta foods are great all year round! They're ideal for family get togethers or parties - Tex Mex cooking offers something for every taste: spicy, vegetarian, sweet or savory! Fathers Day is celebrated on the third Sunday in June in the USA, and on the first Sunday in September in Australia. 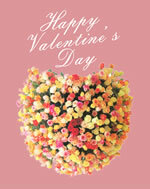 Make greeting cards for Dads or grandfathers with clip art, or print and fold a ready to give card for Dad or Grandpa. Got the World's Best Dad (or Step Dad? Uncle? Grandfather?) - print out an official Award Certificate, and present it along with a new bookmark or a bunch of IOU Gift Coupons! 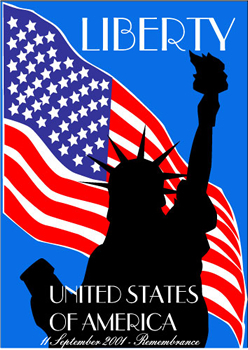 Labor Day in the US is a federal holiday, celebrated on the first Monday in September. Unlike labor holidays in other countries, the US celebration honors the working labor force and is a non-political holiday. The first Labor Day celebrations in the late 1800's were promoted by the labor unions; was adopted by the US government as a September holiday to honor workers in America in 1894. Congress passed an act making the first Monday in September of each year a legal holiday in the District of Columbia and the territories after numerous states had already adopted the first Monday in September as the official labor day for their citizens. Americans today observe the holiday as the last vacation opportunity of the summer. It's a day for family outings, picnics, barbecues, and one more trip to the beach or amusement park before the start of a new school year and the onslaught of winter weather. September 11, 2006 marks the 5th anniversary of the day that changed America and the world forever, when four hijacked airliners carrying passengers crashed into the World Trade Center towers in New York (2); the Pentagon building in Washington (1); and a rural Western Pennsylvania field (1). TLAPD is celebrated world wide on September 19 every year. Get your pirate gear together in time for the big day - and work on your own personal "Pirattitude". Make some party decorations and prepare your pirate garb - a pirate hat, Jolly Roger, a tee shirt, perhaps a bandana for your head or an eye patch? If you need a full costume, sail on over here. Wee ones can color pirate pictures, search for hidden treasure with a pirate's treasure map. Make invites or greeting cards and other pirate goods with free pirate clip art and printables. Make your own very piratey decorations with free printables. At the very least print yourself a flag for your window, desktop or antenna to display September 19. Oh, and be sure to be talkin' like a pirate come the 19th September, mate, or ye may be findin' yerself walkin' the plank, or worse, balancin' on the yardarm. Get double duty from your Talk Like a Pirate Day skeleton and pirate props and decorations, even your costume, for Halloween and Mardi Gras party celebrations. The United States honors its veterans of the armed forces with a holiday of remembrance observed on the commemorative anniversary of the end of World War II - November 11. Canada, Australia and European nations observe November 11 as Remembrance Day - similar to the USA Memorial Day holiday in May. Remembrance Day and Veterans Day are both solemn days of reflection and remembrance for those who served in wars. 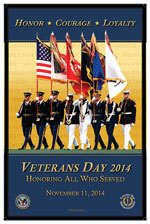 Citizens pause on November 11th at 11 am for a moment of silence in observation of this solemn day. The first Remembrance Day - held in 1919 - was originally called Armistice Day and it commemorated the end of the World I War on November 11, 1918, at 11am (the 11th hour of the 11th day of the 11th month). In the US, citizens salute all veterans and members of the armed forces for their sacrifice and service to the cause of freedom on November 11 by wearing a poppy and attending parades and services in their honor. The UK and Commonwealth nations honor the cause by wearing a poppy lapel pin in the month of November.